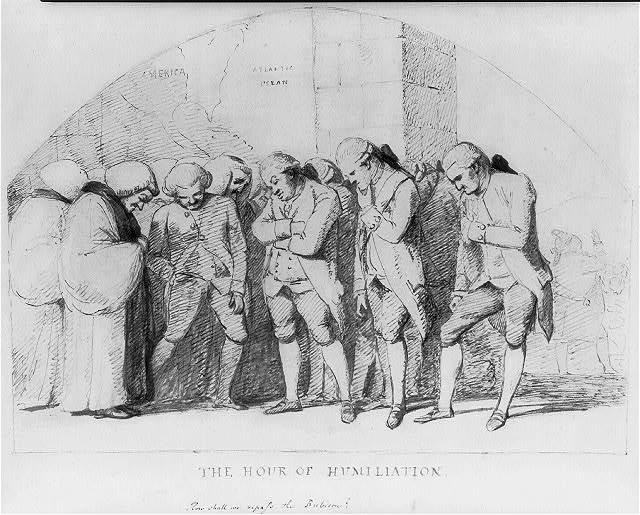 Why is this picture titled "The Hour of Humiliation"? What emotions do you believe are affecting the men in this picture? Can you remember any time in your life that you lost something? In a short paragraph can you describe how you felt? Please explain the event and your emotions? How does your event compare to the picture reflecting the loss of the colonies in North America, as a result of the news of the Peace Treaty of Paris 1783? Reading the Voice of America article, do you believe Puerto Rico should apply for statehood, stay a commonwealth (U.S. Territory) or become an independent nation? Explain your reason in a short answer and find one qoute from the article to support your answer.